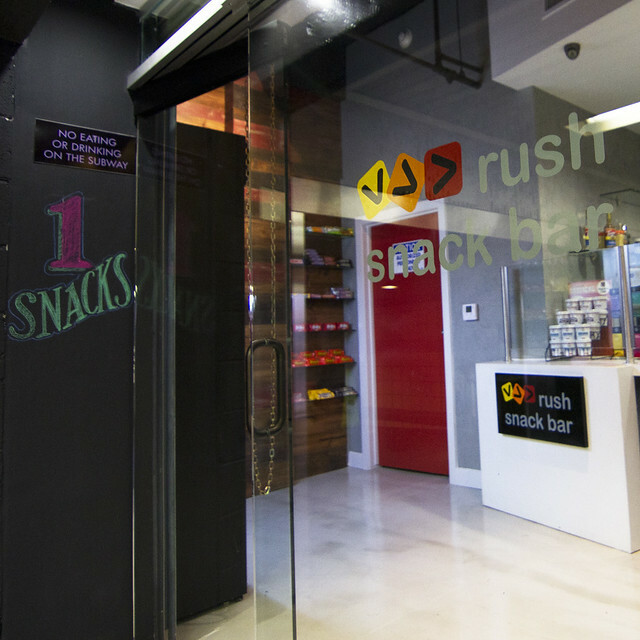 When Andrew Cohen finally opened the doors to Rush Snack Bar this morning it was obvious that he made the right naming choice. The flood of early morning commuters coming from the bowels of the 7th Street Metro Center Station proved that rush hour is the right time to entice groggy Metro riders with a snack or beverage. L.A.’s first retail store in a subway station has received a surprising amount of hype – the little snack bar even made it into the L.A. Times this weekend. Cohen, who worked for years to obtain the easements for the subterranean space tucked inside the Hope Street portal of the subway station, could not be happier about the attention his venture has received. In fact, if the 7th Street Metro Center location is a hit, he hopes to branch out and create a chain of snack bars at other Metro stations throughout the city. And when you walk into Rush you can’t help but notice hints of its inspired European heritage. The space itself is tiny like any good Parisan cafe, but it’s clean and well laid out so that it doesn’t feel cramped. Wood paneling along the walls make you forget that you’re in a subway station. The concise menu is artfully crafted with chalk lettering – no glaring flat screens here. Despite the rather plush interior the menu itself is simple and affordable – well within the range of any Metro rider’s budget. A dollar menu has the expected chips, sodas and other convenience store fare but I was most pleasantly surprised to find some healthier options on the menu. 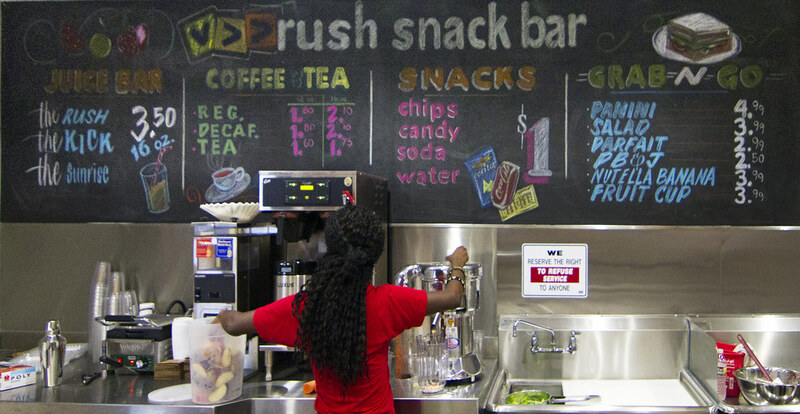 A juice bar offers freshly blended veggie and fruit concoctions for $3.50. The “Grab-N-Go” menu offers slightly heartier fare – great for lunch – all for under $5. I ordered a juice drink (“The Rush”) and a veggie panini (freshly made, not prepackaged) for an under $10 lunch. If that’s still too spendy, Cohen is currently working with Metro to offer a Destination Discount to Metro riders, so stay tuned to The Source for more info on that deal. 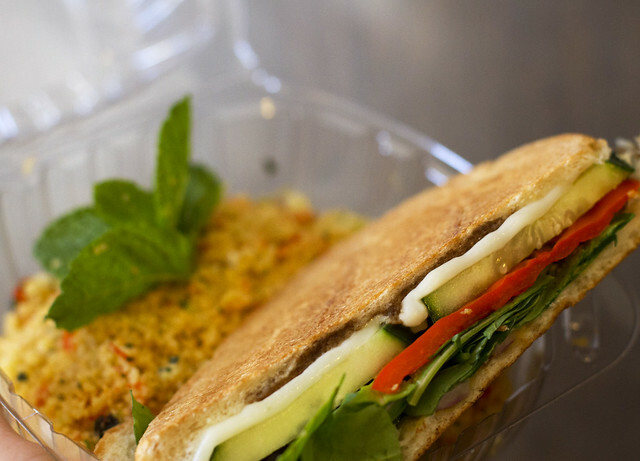 More than your average snack: a veggie panini and couscous from Rush Snack Bar. The Rush Snack Bar team poses behind the counter on opening day. A small sign at the entrance reminds hungry commuters that there's no eating or drinking on Metro trains or platforms. Hooray for free market common-sense capitalism, down with stupid bureaucratic red-tape that says train stations can only be used as unitasking train station. Just wait until the subway and light rail hits Culver City and West LA. Those Japanese business owners near the Sawtelle area will show what a real multi-use train station can achieve. Just wanted to chime in with my own two cents. I think what’s promising about this — beyond the convenience to transit users — is that an entrepreneur is confident enough about the strength and future prospects of public transit in L.A. that he’s willing to stake his enterprise on it. That is illustrative of a positive overall change in attitude in this region. I was a huge cheerleader on Famima!! Japanese market at Union Station, but this is also big news for Los Angeles’ public transit. Any kind of blending of rail and retail is a good idea. My travels don’t always take me through 7th/ Metro, but I will pay Rush a visit the next time I head that direction. Can’t Wait to visit and try it out! The design is appealing and if the food is just right, they will have me hooked. I realize the business is new, but does anyone know the hours for the place? I’d like to give the guy some money for a late night smoothie. Amazing space. I was so glad to see it open for business. As I stood inside the store, I looked at all the people walking by and almost all of them peered inside Rush Snack Bar almost in confusion that there was this “new store in the subway station.” I am hoping this becomes the new model for LA’s transit system and that we can finally bring food on board (with NO LITTER laws as opposed to no eating laws). Ah, this is great! We need more of this, but I am noticing the major caveat the LA Times article brings up: the shop is not located on Metro property. This is important, first because I think it could legally protect them from any litigation that could come from Metro’s current no eating or drinking policy (as well as that carefully placed sign as a courtesy). But it is also discouraging because it means this was likely a unique case given there was access to privately owned space within the station (ostensibly). Because this isn’t really the norm in any other Metro station, my guess it would still take some re-working of Metro policy, whether it is the eating/drinking ban or the consideration and creation of public-private partnerships for retail spaces within Metro-owned property. Or both. All of which take time! Step in the right direction though, for sure. The key will be whether he can turn a good profit in that location. That will likely inspire imitators and help to expand the presence of commercial enterprises in metro rail stations. I frankly have never understood why metro doesn’t have newsstands on platforms, since they’d likely do brisk business and another set of eyes and ears would certainly help with safety. Oh I think it will do very well; not only there is no competition right now, but you also have thousands of potential customers that go through the station everyday on their regular commute. Unlike a retailer in a strip mall where the business owners have to wait for a customer to park his/her car and buy stuff, you already have potential customers right then and there. And you’re right about the added security benefit which was one of the reasons why I promoted multiuse of train stations; a desolate train station at 4AM is very scary with no one around, but a 24 hr CVS Pharmacy at 4AM still feels very safe because you know someone is around in the store. Metro doesn’t have to add more officers into the station, adding extra set of eyes by letting merchants and retailers have the same effect in keeping criminals lurking in the stations. In the business world, this called a win-win situation. It benefits Metro by bringing in retail space revenue and it also adds more sense of security with extra set of eyes from the merchant and retailers that are stationed there, it promotes business activity in tough economic times, it introduces competition to kill off illegal vendors from the trains, and it provides yet another service that benefits the commuters. See what you can accomplish if you get rid of stupid bureaucratic redtape (oh noes, train stations have to be used only as train stations, oh noes, it’ll go against the no eating/drinking policy waaah) that prevents retailers and merchants from opening up shop inside the train station? Next up, I’d like to see the ability for merchants and retailers inside the stations to allow payments and topping up cash value with TAP. @Brad, when I ordered a panini and the sunrise smoothie there, I asked him what the hours were and he said daily 7am-7pm. So no [really] late-night smoothies.